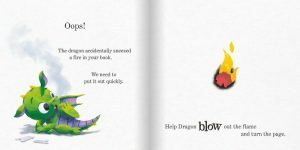 Fun+ Interactive: There’s a Dragon in Your Book! 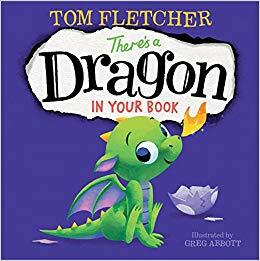 I was so excited to be accepted for the blog tour for picture book There’s a Dragon in Your Book by author Tom Fletcher and illustrator Greb Abbott. You might recognize Tom Fletcher from being a member of the band McFly, or perhaps some of his other books, like There’s a Monster in Your Book, which I reviewed here. If you are looking for a fun book to read-aloud to – and with – children, then you need to pick up There’s a Dragon in Your Book (add to Goodreads). The basic premise of the story is that you open up your book and what is this? an egg in your book! As you turn the page, your egg hatches and you have a dragon in your book – but it’s okay! It’s just a baby dragon…until that baby dragon sets your book on fire. This is a really quick read, but it’s sure to be a fun way to read with the kids in your life. They can tickle the dragon’s nose, flap the book like wings, and much more. It gives a really enjoyable interactive element, which will definitely please book lovers and even those a little reluctant when it comes to reading. I might be an adult, but I still found myself smiling as I read There’s a Dragon in Your Book. It just makes you happy, and the illustrations by Greg Abbott are so well done. You’ll definitely find yourself wanting your own little baby dragon by the end of the book – just like Hagrid in the Harry Potter books! This is a great book for any time of the year, but with Halloween coming up, I can’t think of a more suitable time! Grab your copy of There’s a Dragon in Your Book today. Tell me: How do you feel about “interactive” type of picture books? Do you have any favorites? Sounds so cute for little kids! And dragon fans, of course! My daughter always purchases 21 books during december and the kids get to open one book a night leading up to christmas. pretty sure she will want this book. This sounds adorable. We loved Monster in Your Book, so I imagine this would be a hit with the Royals. I am picking this book up from the library today–I put it on hold as soon as I read about this fun book. I also have Monster in your Book waiting as it also sounds fun. Wow, do they have the stuff for kids these days! 🙂 My son went through a dragon phase. How cute is this book?!?! Love it! This looks like such a fun one! And I love the colorful artwork. Wow this looks like so much fun, baby dragons are greats! This sounds adorable! I’m sure both of my kids would love it, thanks for sharing this! Looks adorable! Who wouldn’t love a baby dragon? I have a 4 year old niece and nephew that would LOVE this book. Thanks for sharing! Ahh that does sound cute. I already want a baby dragon! My middle child would just love this book to pieces! Aww this looks so cute! Which age group would this book fall into? I love interactive books! We have one called “The Curious Case of the Missing Mammoth.” It has several flaps with pictures to open or hidden clues to find the mammoth. My oldest loves it! How cute is this?! We never tie of books like this around here.